The Sustainable Living Center(SLC) is a non-profit that functions out of Pringle Creek Community. It raises awareness through environmental education, demonstrates different ways people can choose more environmentally-friendly practices, and activates this through many fun activities and events throughout the year. One of these events coming up is the Sustainable Holiday Market. If you’re looking for some handmade gifts that are also made from upcycled materials, then this is the market for you. 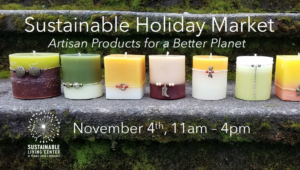 The SLC will be having the very first Sustainable Holiday Market on Sunday, November 4th, from 11 – 4:00pm. There will be vendors from Salem and the Willamette Valley showing their arts and crafts. These could make perfect gifts for you an your loved ones for the holidays. From the SLC’s FB event page: Want to support local artists who create sustainable products and find unique gifts for the holidays? New this year, our Sustainable Holiday Market on November 4 will feature a selection of products made from recycled/upcycled materials and other items to help reduce waste in our everyday lives. In addition to this lovely event, Urban Farmers Class is right around the corner. It’s a lovely workshop series where you can learn all the ins-and-outs of Urban Farming from our very own expert Urban Farmer, Colleen Owen. We are looking forward to seeing you around for the holidays and celebrating earth-friendly activities together!